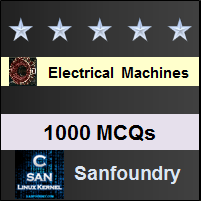 This set of Electrical Machines Multiple Choice Questions & Answers (MCQs) focuses on “Starting of Synchronous Motors”. Explanation: The average torque developed in the synchronous motor is zero. Explanation: A sub motor is needed to make the synchronous machine run till the speed of synchronous speed and to achieve that we need additional motor. Explanation: Auxiliary motors usually reduces the performance indices of the synchronous machine when started under load. 4. Rating of the dc motor to be used in the starting of SM, should be higher than the synchronous motor. Explanation: No, the dc motor used as pony motor is of lower rating than the synchronous motor it starts. 5. A synchronous machine with its field winding on stator and polyphase armature winding on rotor. Explanation: The air gap will not be at synchronous speed w.r.t. rotor. Explanation: The excitation is given on rotor so the air gap field will be stationary w.r.t. rotor. Explanation: Having cross magnetizing armature reaction in the machine means partial magnetization and demagnetization, adding another clause is useless. Explanation: Large air gap ensures more SCR value and better preformances. I. In a cylindrical-rotor synchronous machine, armature flux is in phase with armature current. II. In salient pole machine, armature flux lags the armature current. Explanation: In CRSM, there is no saliency and the armature flux follows armature current in phase. 10. In a 3-phase cylindrical-rotor alternator, synchronous reactance is sum of mutual and leakage reactance. a) power factor increases and then decreases. c) power factor decreases upto a certain value of field current and then increases. Explanation: The magnetization current is increased as we increase the excitation, so the power factor will increase upto the saturation and then again it will decrease. 12. A synchronous machine is operating at constant load and at unity power factor. Explanation: It will operate at leading p.f. if it was in motoring mode. Explanation: It will operate at lagging p.f. if it was working as generator. Explanation: p.f. = f(V,E,f,Field current).